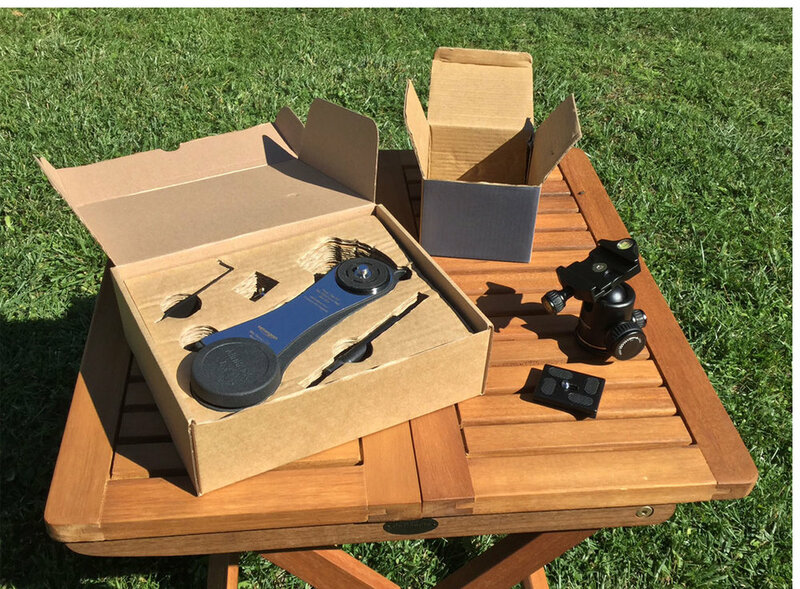 This new purely mechanical tracker based on a simple clockwork is conquering the sky tracker market. We gave it a closer look. The Mini Track LX2 is a small camera tracker that provides 60 minutes of tracking time. 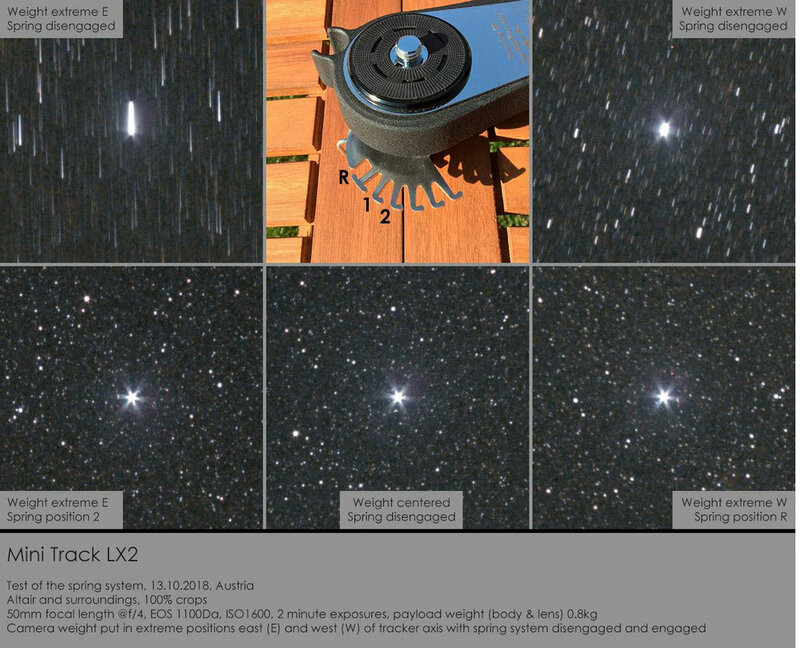 It was developed by Italian astrophotographer Christian Fattinnanzi and is distributed by Omegon. The device stands out among the other available sky trackers, since it is driven by a mechanical clock that needs no electrical power source. Besides that, it brings another innovation: To compensate for the camera weight, it features a spring mechanism that helps to stabilize the tracking rate. The device is well built in an almost all metal design and makes a good overall impression. At 430g the Mini Track LX2 is very lightweight and compact, its dimensions are 21x8x5cm. In September 2018 we bought a unit and immediately started with thorough tests. Here is what we found out. The little device gets shipped in a neat cardboard box. 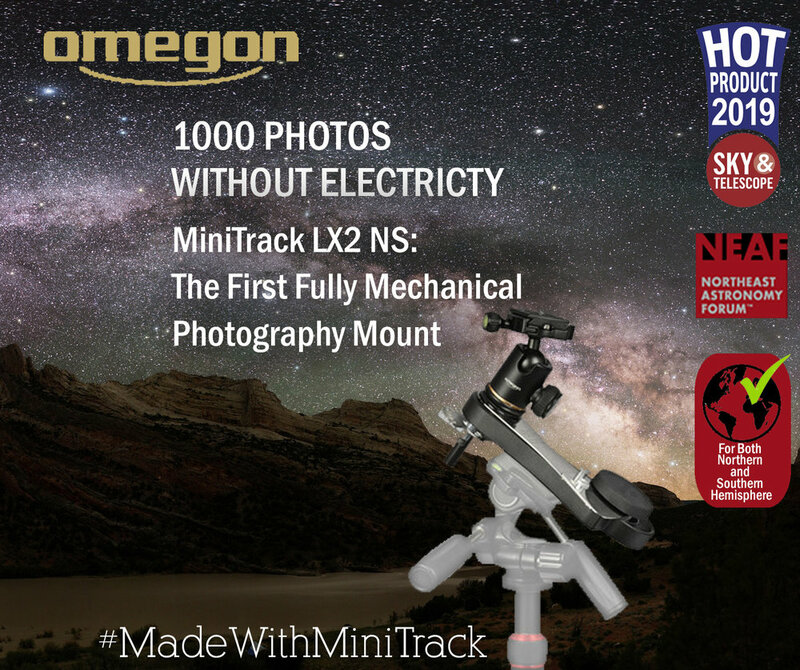 As the picture below shows, the Mini Track LX2 is available in a bundle with a ball head. The ball head is Arca Swiss compatible and a dovetail plate is included. The shipment also includes a 1/4" adapter screw to replace the 3/4" version for mounting the ball head. This allows the photographer to attach a ball head with the smaller 1/4" thread. A key to switch between the two adapter screws is also provided. Besides the tracker itself, the shipping box also includes a small sighting tube. It is basically a piece of a black plastic pipe that can be attached to the tracker and is serving as a means to align the tracker with the celestial pole. The shipping box does not include a printed manual, only a note that refers to the Omegon website, where the user manual can be downloaded as a PDF in several languages. The manual is actually very well written, illustrated with many drawings and highly informative, especially for photographers who are not familiar with astronomical terms and procedures. Have a look at the manual for yourself at www.omegon.eu. graphic equipment that gets in contact with it during storage and transportation. 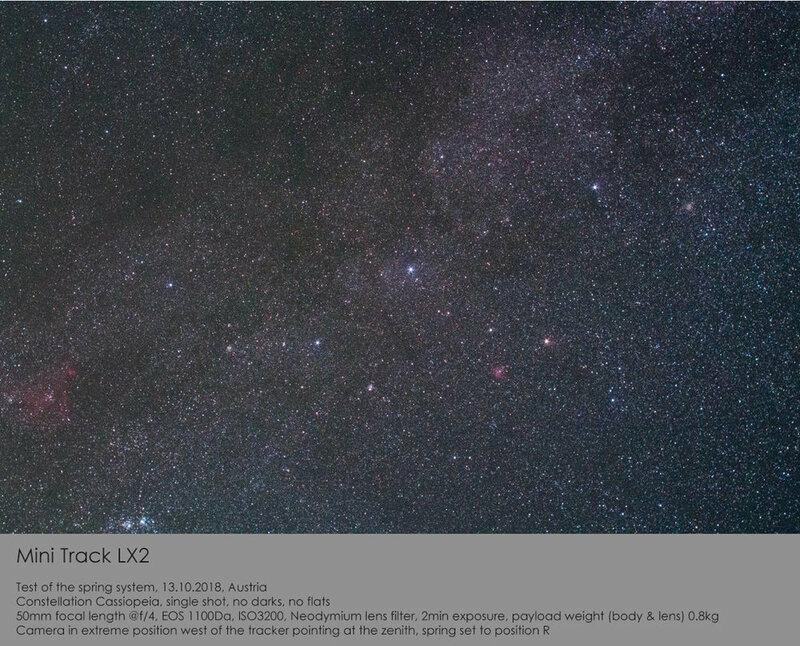 On the evening of September 29, 2018 we did a first test of the device's tracking precision from our dark sky site in Austria. The tracker was mounted on a photo tripod with a geared head. For testing we used a Baader modified EOS 1100Da body. Our target was Altair, which was near the meridian during our tests. Altair is also close to the celestial equator, which makes sure that the tracking errors of the device show to their full extent. Several exposures with a 50mm lens made it clear that the exposure time should not exceed 2 minutes at this focal length. This nicely confirms the rule of thumb the manufacturer gives for the valid exposure times. It says that the maximum exposure time in minutes is 100 divided by the focal length. exposure times could even exceed that. For these short exposure times polar alignment does not have to be very accurate. Since we do not want to strain the small device with the maximum payload of 2kg we only use the MiniTrack with very lightweight equipment. For the test we used a 50mm lens on a DSLR body, weighing in at a total of 0.8kg. Again, we shot Altair, this time with different camera positions. We made exposures with the camera's center of gravity above the tracker, east of the tracker and west of the tracker and tried different settings of the spring. The results showed that at the extreme positions in the west and east, with this payload weight the spring settings "R" and "2" work effectively to stabilize the clock drive's tracking rate. This test image is a single 2 minute shot of the constellation Cas with a Baader modified EOS1100Da body set to ISO3200 and a 50mm lens working @f/4. We used a Neodymium lens filter to increase the contrast. one tracked and with a diffuser filter for the sky, one untracked and unfiltered for the foreground. The two shots were combined in Photoshop and some additional slight processing was applied. patterns more obvious, the stars were deliberately blurred with a diffuser lens filter. In the center of the image Saturn shines brightly. As mentioned above, the foreground is from a second unfiltered shot made without tracking. As a final test, we wanted to find out the limits of the small tracker. 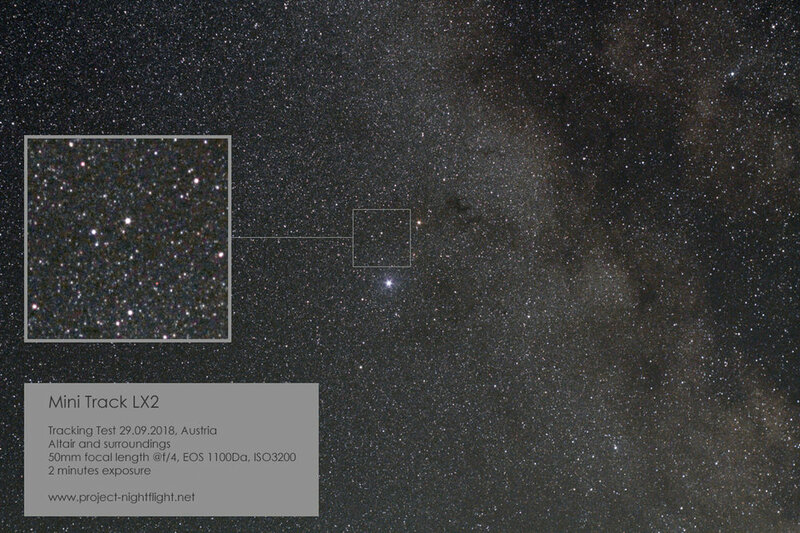 We set ourselves the goal to produce an image of a less bright deep sky object with a typical DSLR tele lens. After some discussions we chose to shoot NGC 1499, the California Nebula, with a 135mm lens. Our approach was to keep the individual exposures short, shoot at a high ISO setting and compensate for that with a large number of individual frames. The actual exposures were made during Halloween night, on October 31, 2018 from La Palma island at an altitude of 800m above sea level. The shots turned out quite nice. We had to sort out some of the subs due to clouds that passed during the exposure series, but not a single frame was ruined by trailing. This test image of the California Nebula was acquired on October 31, 2018, from La Palma island with an EOS 1100Da body and a Zeiss Sonnar 135mm lens working @f/4. The ISO setting was 6400 and a Hutech LPS-P2 light pollution lens filter was used. The image is a photoshopped stack of 109 subframes, 20 seconds each. Flats, flatdarks and darks were applied. 135mm, we advise beginners to stick to brighter targets that can be captured with short exposure times, e.g. the moon's earthshine, lunar eclipses or bright star clusters. With more experience, one might even try to shoot dimmer deep sky objects with tele lenses. In this case, we recommend to keep the exposure times short, use a high ISO setting and reduce the inevitable noise with a large number of subframes that are later combined with stacking software. A new version of the tracker has been released that also works on the southern hemisphere. 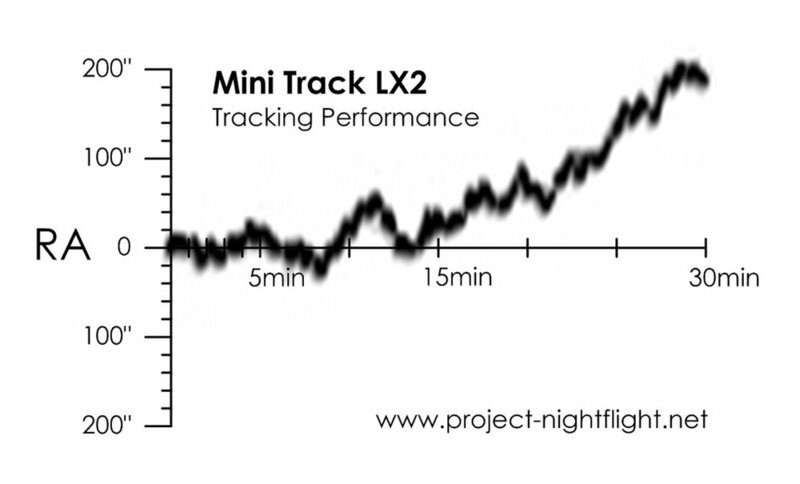 The new version goes by the product name Mini Track LX2 NS. For those who want to enjoy the convenience of an optical polar finder Omegon released a finderscope adapter. The adapter gets screwed onto the tracker body, replaces the polar sighting pipe and provides a clamp that holds any finderscope with a diameter around 23mm. We tested the adapter with a typical 6x24 crosshair finderscope. These small scopes are low-cost, widely available from numerous telescope dealers and fit nicely into the adapter. We found out that although the achievable polar alignment precision is not increased very much, the procedure of polar alignment becomes easier. Polaris is much better visible in the finderscope and can be centered more easily than with the sighting pipe that comes with the tracker. As we pointed out in our review, for the recommended exposure times in minutes of 100/f[mm] the polar alignment is accurate enough when simply aiming at Polaris, with or without a finderscope. In the meantime, a small carrying bag for the Mini Track LX2 has also been released. When the guys at Omegon read our initial report, they contacted us and sent us one of these bags for free, asking to take a look at it. Holding the bag in our hands it was immediately clear that this is the accessory we recommended and asked for in our review. 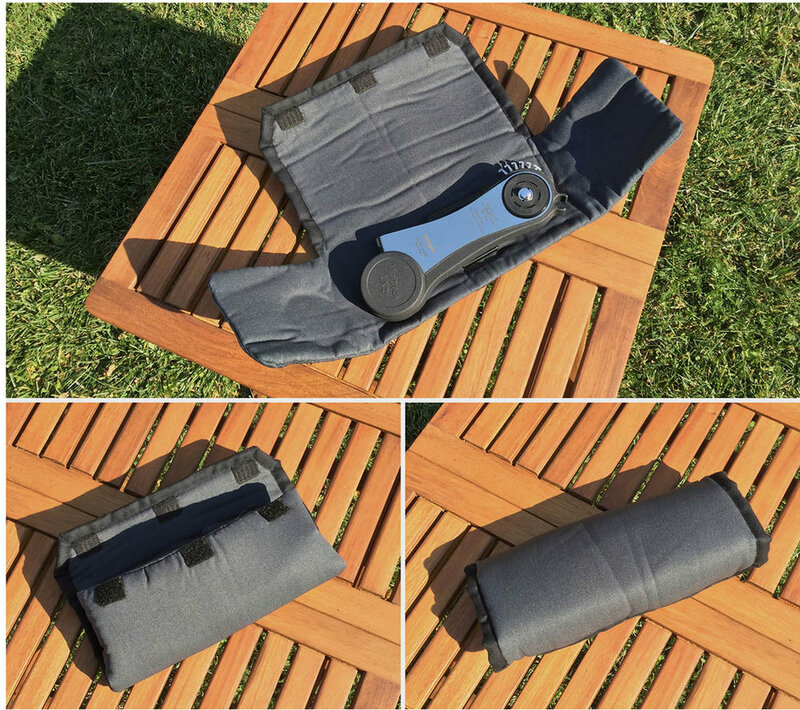 The bag is of high quality, softly padded and fits the tracker perfectly. The Mini Track even goes into the bag with the polar scope adapter attached and there is room for a small finderscope, too. We highly recommend this accessory since the tracker has some very sharp edges. With the Mini Track kept in the bag for transportation, other photographic equipment in your camera backpack is sufficiently protected, as well as the tracker itself.